Sports fans, if you're in the need for a vacation destination, why not make your team choose for you? The following cities have been ranked based on quantity of franchises, quality of the teams in recent years, and the vibrant personality of the cities. 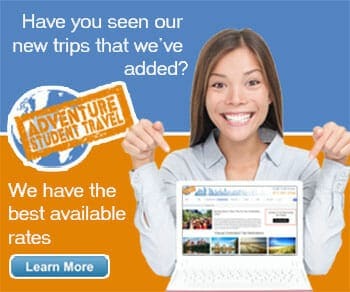 Each one would make a spectacular student group trip destination so what are you waiting for? Home to four franchises in all four major U.S. sports, Boston brings in the gold year after year. The New England Patriots (four Super Bowl wins since 2000), Boston Red Sox (three World Series since 2000), Celtics (one championship win), and the Bruins make Boston a championship city that everyone loves to root for. Not only does Boston win in sports but it also wins in the tourism department. Birthplace of the American Revolution, home to the Freedom Trail and a number of significant historical landmarks, Boston is an excellent city for walking tours in your free time between games. Although L.A. doesn't have an NFL team (as of now), they do have award-winning teams in the NBA, MLS, and their hockey team is up and coming. Plus, there are rumors of an NFL team coming back to Tinseltown, which might be enough to bump the city all the way up to the number one position. L.A. hosts the ESPYs every year, along with the Rose Bowl and two major college teams in the Pac-12 conference. Beyond the teams, L.A. is one of the most exciting cities in the entire country and home to Hollywood, Disneyland, and a number of other attractions making it easy to turn a day trip into a full vacation. New York cannot not be on this list, if you know what I mean. What the city doesn't have in quality (sorry NY fans), it makes up for in quantity. With 11 teams over the four major sports (plus soccer), New York has enough team diversity to keep anyone interested. Their fan base, by the way, is extremely loyal which makes any visit a fun time. New York, aside from their teams, hosts a number of sporting events including the U.S. Open in tennis and golf, the NYC Marathon, Belmont Stakes horse race, as well as the NFL and NBA Draft. With a franchise in each major sport, Dallas, while not a super winning team of late, goes hand in hand with sports. Where would we be without the Dallas Cowboys? While the Tony Romo era of the Cowboys may be over, Dallas has room to grow and boosts sports fans' morale with college team successes, the Cotton Bowl, NASCAR races, and the UFC fights in the American Airlines Arena. Plus, as an added bonus, you can tour some of the Lone Star state's best attractions including the Dallas World Aquarium, Reunion Tower, and many others. According to Fansided.com, the San Francisco Bay Area is a "hot bed for talent," including six professional teams (if you count Oakland and San Jose). San Francisco alone is enough to tempt many a traveler but when you throw in the exciting teams that call the city home, then you have a recipe for the best vacation ever. The SF Giants and Oakland Athletics, the 49ers and Oakland Raiders, San Jose Sharks and Golden State Warriors fill the city with cheering and championship wins - especially the Warriors who just won the 2015 NBA Title against the Cavaliers and the Sharks who've won the division title six times since 2000. Chicago is serious about sports. Like, super serious. Five teams in four sports, Chicago has the intensely loyal fan base for the White Sox, Cubs (Wrigley Field, anyone? ), Bears, Bulls, and Blackhawks. Their sports history alone is enough to earn the city a top ranking, having once played home team to Michael Jordan among others. Not only is it a wonderfully popular baseball, basketball, and hockey city, Chicago's reputation for soccer has risen in recent years and they also play host to NASCAR's Sprint Cup Chase, bringing in thousands of fans yearly. Having just won the World Series, let's give the home of the Royals some love. Kansas City also plays host to the KC Chiefs, Sporting KC pro soccer team, as well as NASCAR's Kansas City Speedway. Although 1969 was the one and only time the Chiefs won the Super Bowl, Arrowhead Stadium is still cool enough to warrant a trip. Fun fact: Arrowhead Stadium holds the record for loudest crowd roar in a sports venue. Plus, win-win, Kansas City has some of the best barbecue in the whole country and has a ton of free attractions that make for easy, fun, and affordable itinerary fillers when you're not watching a game/race/match. Though the city actually has some pretty good teams, and they love their sports, the City of Brotherly Love isn't so loving if you're rooting for the opposing team - which is why it isn't higher on the list. Other than that, Phillie is the home city of the Super Bowl champion Eagles (1980, 2004), the World Series winning Phillies, as well as the Sixers and the Flyers. Also, if you're a soccer fan, you're in luck as the sport is gaining ground in Philadelphia with the 2015 CONCACAF Gold Cup Final just come and gone. Another plus, Phillie is one of those cities where you can grab a cheesesteak sandwich at a stadium and know it's probably a good one. With a team in the NBA, NFL, MLB, NHL, and MLS, Denver is a major contender when it comes to talented teams. The Broncos, under the direction of QB Peyton Manning, have gained national attention once more and have become a team to watch. The altitude, however, doesn't bring many sporting events to the city but that doesn't make it unloveable! Denver is intensely gorgeous, with the Rocky Mountains as backdrop to the high plateau and plenty of outdoor recreational activities to enjoy while you're here.